Our recent Webinar with BookingSuite highlighted 2 important aspects: The challenges that hotels face when managing their revenue and the modern technology required to address them. The event saw widespread participation from not only different regions but properties of varying sizes, reconfirming that revenue management is equally important for large chains and small independent hotels . Our speakers for the Webinar were Idan– Global Commercial Manager at BookingSuite and Kumar – CEO of REVOPT. The knowledge and experience they brought to the table was very insightful. While Kumar cleared misconceptions surrounding revenue management and the role a revenue manager plays, Idan acquainted us with modern tools like RateIntelligence and RateManager for facilitating optimum pricing strategies. Konark – Alliance Manager at Hotelogix also added to the session by discussing the role that a PMS plays in a Hotel’s revenue management operations. 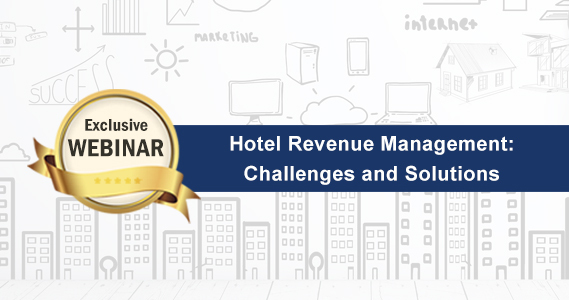 The Webinar addressed real world challenges for Hotels like unpredictable demand, multiple booking sources and time consuming processes that adversely influence room price setting. Technology becomes a key ingredient in any hotel’s revenue management – right from the point of data collection to swift and efficient execution at tactical level. Both speakers concluded on Combining the right mix of data with an apt revenue management strategy for hotels to drive optimal revenue. Kumar: To predict demand and Forecast, you need to work with two kinds of data – Internal and External. Internal refers to data extracted from your PMS, company strategy, product related changes. External data refers to your environment, competition, and industry performance. Additional factors like historical pattern, micro-level segmentation, market conditions also come into play. Try and understand the behavioural pattern and performance of each market segment, track their pace, historical pattern (or performance pattern), future pattern (or booking pattern). These combined with the additional factors help predict demand and forecast them to – Constrained or Unconstrained (also called true forecasting as not limited to capacity of hotel). How does the PMS and Rate Manager incorporate revenue streams like that of Spa, which in itself has complex revenue streams? Idan: Right now, Rate Manager doesn’t support this. It extracts data needed for just room revenue recommendation. This is because majority hotel partners have chosen revenue recommendation for rooms as their most immediate need. What is the ideal period to push data from PMS to BookingSuite? Idan: Ideally it should be 3 years of data, but some systems come with just 1 or 2 years of data and that can be worked with too. Of course, more comprehensive data means better forecasting. For daily operations, BookingSuite has an API connectivity with PMS’s like Hotelogix. Every time a rate recommendation comes in, it triggers the algorithm to recalculate the recommendation. One odd reservation may not impact the rate recommendation, only in case of group or large volume of bookings. Does a raise in pricing affect the occupancy of remote destination? Kumar: Yes and No. Key to pricing depends on buyers perceived value – It’s the customer’s assessment of whether he is getting the right value for the amount paid and how sensitive is your customer to increase/ decrease in room price. Your hotel’s location doesn’t have a major role in this regard. How beneficial is rate shopping tool to heritage hotels? Idan: More than property type, rate shopping tool will make an impact with respect to the market type – how dynamic is the market, additional demand levels through the year, etc. RateIntelligence tool is a great starting point to manage your room rates more wisely. It’s much superior to time consuming methods like checking your neighbouring property’s website, rates on OTA’s etc. Can we sell at lower room rates on the brand website? Kumar: All booking channels must be utilized equally for better opportunities and optimum revenue. It’s recommended that guests should be pushed to the brand website by offering a discount or maybe an upgrade, rather than lowering room rates on them. Slashing rates on the website won’t amount to any significant advantage since OTA’s are one of the most popular booking options for guests worldwide. Idan: Hotels need to choose the right partners through which they want to distribute the rates. Offering the same rate on brand website as channels help them optimize on this partnership. How is Rate Intelligence different from Rate Manager? Idan: RateIntelligence is a report whilst RateManager is a solution. RateIntelligence only displays competitor pricing, while the rest – setting the price, checking internal data, PMS data, external data is done manually. With RateManager, you get all that data, analysis & forecast through the tool, finally translated to price recommendation and automatically/ semi-automatically pushed to the Channel Manager. What’s the ROI with BookingSuite tools? Idan: Although BookingSuite provides a comparison report between current and last year revenue level and Hotelogix also comes armed with benchmarking reports, it is challenging for any software to come up with a clear ROI because we are looking at only one component of the business at a time and have no control over other factors like marketing, room descriptions, etc. The tool intends to optimize on your work process by providing all the relevant data. This data combined with analysis by the hotel staff/ owner can provide maximum value to the hotel. Is it beneficial to close high cost channels on days of high occupancy or increase rates across all channels despite commission structure/ negotiated rate? Kumar: It’s advisable to keep the high cost channels open at all times, irrespective of occupancy levels. It’s imperative for hotels to be available across all channels and do justice to all of them. As a hotel, I work with standard and non-refundable rates on OTA’s, does BookingSuite help me with a rate plan on both? Idan: BookingSuite can provide both. Hotels can also manage their room type, rate plan independently. Pricing can be customized according to their requirements. Will BookingSuite tools assist on pricing structure, or is it automated? Kumar: A comprehensive pricing structure needs to be created by the hotel staff/ owner themselves. They can seek help from these tools for required data.